By Jim Dower: IBF middleweight mandatory challenger Sergiy Derevyanchenko’s promoter Lou Dibella is trying to position him as the replacement opponent for IBF/IBO/WBA/WBC middleweight champion Gennady ‘GGG’ Golovkin to fight on May 5 if his scheduled fight with Saul Canelo Alvarez is canceled due to the Mexican fighter receiving a suspension by the Nevada State Athletic Commission. Canelo tested positive twice for clenbutero last Febuary. Derevyanchenko is currently not one of the options that GGG’s promoters have been looking at as a replacement opponent. They initially had 2 names – Gary ‘Spike’ O’Sullivan and Jaime Munguia – as options for Golovkin to fight on the 5th of May. Munguia (28-0, 24 KOs) is now out of the picture. The 33-year-old middleweight contender O’Sullivan (27-2, 19 KOs) is said to be the fighter that Golovkin’s management will be matching him against on may 5. Derevyanchenko’s promoter Dibella had his lawyer send a letter to the International Boxing Federation to try and get them to order the fight with Golovkin, according to Dan Rafael of ESPN. Derevyanchenko has been the IBF mandatory for 8 months since beating Tureano Johnson by a 12th round knockout on August 25, 2017. The idea is that if Golovkin takes a voluntary defense next month on May 5th, and then he faces Canelo possibly in September, then it will have been 12 months since Derevyanchenko became the IBF mandatory without having been given a title shot. It’s not likely the IBF will order Golovkin to face Derevyanchenko before his next title defense on May 5, which is too bad really, because a fight between those two guys is a lot better match-up than the current situation. The IBF are good with ordering title defenses in a timely fashion, but it’s not realistic that they’re going to push Golovkin to face Derevyanchenko on 3 weeks’ notice if he finds on April 18 that Canelo has received another suspension by the Nevada Commission. O’Sullivan is a poor replacement for Canelo for Golovkin, because you go from a competitive 50-50 fight to a virtual mismatch. O’Sullivan stands no chance of beating Golovkin UNLESS he’s gone downhill since his last impressive performance against Dominic Wade in 2016. It’s impossible to say for sure if Golovkin has lost anything from his game, because he chose to box Canelo and Daniel Jacobs instead of looking to destroy both of them the way he’d done with Wade and Kell Brook. Earlier on Monday, Top Rank promoter Bob Arum added his fighter WBO World super middleweight champion Gilberto ‘Zurdo’ Ramirez’s name to the list of fighters that want to step in as Golovkin’s replacement opponent for May 5th.Unfortunately for Ramirez, he fights in the 168 lb. weight class, he’s huge at 6’2 ½”, and he’s a southpaw. Golovkin would have to move up to super middleweight to take the fight, which would make no sense at all. Golovkin wants to defend his middleweight titles and break Bernard Hopkins’ record for title defenses. Moreover, it would be crazy for GGG to face the hulking Ramirez in his first fight in the super middleweight class rather than facing a couple of contenders to get himself acclimated with the division before facing Gilberto. Golovkin’s promoter Tom Loeffler would never have agreed to letting him move up to 168 and take on Ramirez with 3 weeks’ notice. 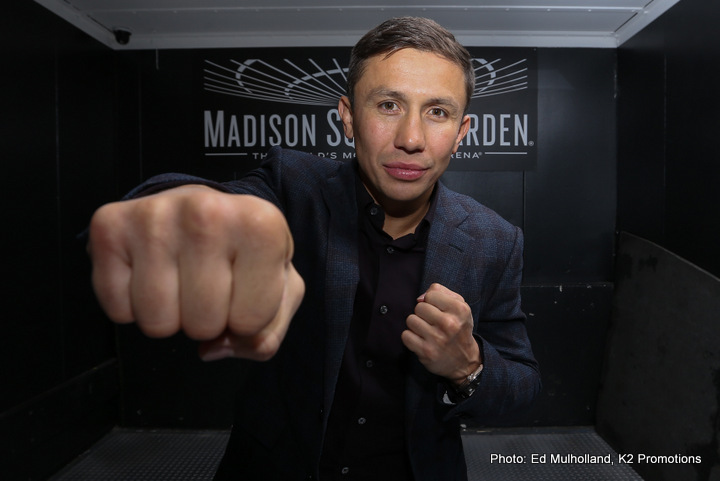 Golovkin is not giving up on the May 5th date. The fight will still be on HBO PPV, which could be a mistake if O’Sullivan turns out to be his replacement opponent instead of a good contender like Derevyanchenko. Golovkin’s Loeffler doesn’t want the boxing fans to refund their tickets because they still plan on having him fight on the 5th of May in Las Vegas. If Canelo, 27, receives a 1-year suspension by the Nevada Commission, they could reduce it to 6 months, which would allow him to return to the ring in September to fight Golovkin in a rematch at that time. Canelo will still have been out of the ring for 1-year because of his preference to fight only twice per year on May and September. Canelo chooses not to maximize the amount of fights he can take. Loeffler will have Golovkin fight at the smaller MGM Grand Garden Arena in Las Vegas on May 5th if Canelo is suspended and unable to fight on that date. The MGM Grand Garden seats 16,000 boxing fans, and it’ smaller than the 20,000 seat T-Mobile Arena in Vegas, which is where the fight between Canelo and Golovkin are currently scheduled to fight on May 5. Canelo is hoping that his case will be dismissed by the Nevada Commission on April 18. According to Canelo, his two positive tests for clenbuterol are from him eating contaminated meat. Canelo tested positive on February 17 and February 20 for clenbuterol during VADA’s drug testing. The Nevada Commission has strict rules in place that makes the fighter responsible for what goes in his body. Perhaps if Canelo had tested positive in another state, he’d have more lenient rules from the Commissions, and his meat contamination excuse might have more success. Hopefully this is the last time Canelo tests positive for clenbuterol, because if this problem continues, he’ll wind up getting suspended again and again. The ticket prices for Golovkin’s fight on May 5th will drop if Canelo is suspended. However, Golovkin’s fight will still wind up on HBO PPV, which is sort of surprising because he’s shown that he’s a PPV attraction. There’s no word whether the PPV prices will drop to a friendly number that the boxing public won’t mind paying. If Golovkin’s opponent is O’Sullivan, it’s going to be really difficult to sell that mismatch to the boxing public. If this were a fight that was being sold to the UK boxing fans in that part of the world, then a fight between Golovkin and O’Sullivan on PPV would make sense. O’Sullivan is from Ireland, and he has a lot of boxing fans over there. But in the U.S, O’Sullivan doesn’t have a lot of fans, and he’s not popular.